Your Solution to Outdoor Hollywood Catering! 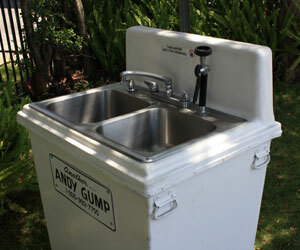 Would you like to provide handwashing sinks with your portable toilet rentals at your tv or film production? We offer hot/cold stainless steel sinks. Portable sinks with hot water are required by law in some states for food preparation stations. 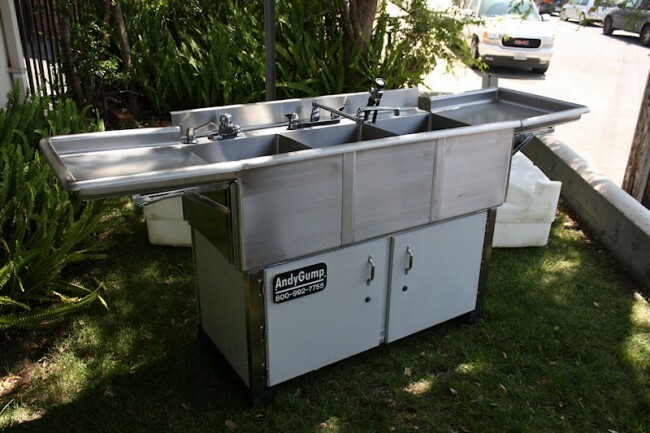 Three Basin Hot and Cold Sinks Ensure safe food preparation – and easy clean up – at your next special event with our portable utility sinks equipped with hot and cold water. Three Basin Hot & Cold Sink The 3-BASIN HOT & COLD WATER SINKS have a three-compartment stainless steel basin with required separation for hand washing, industrial utensil washer. Ensure safe food preparation – and easy clean up – at your next special event with our portable utility sinks equipped with hot and cold water. Our Breeze 2-Station Hand wash meets OSHA sanitation requirements for all construction sites.